Now, normally you would associate a black ankle boot with a wintery outfit, and quite rightly, and whilst it's still only just July you might be thinking that it's a bit early to start thinking about winter footwear. That's true, and there is nothing worse than already starting to see the 'fall' collections coming into stores, and this month's Elle edition being the August one and thus pretty much signifying the end of the summer. So, in dispute of these things, I'm posing about a summery ankle boot, to wit: decorate heavily with fringe, and wear bare legged with a little denim dress or some raw hemmed shorts. How to summer-fy the most wintery of garments in one easy outfit! I do think that a black ankle boot can add significant edge to a cute dress, and if I was not wearing my ballet flats then I would probably pick a boot over a sandal (unless it was sweltering, but lets face it, it's not in the UK that often!) 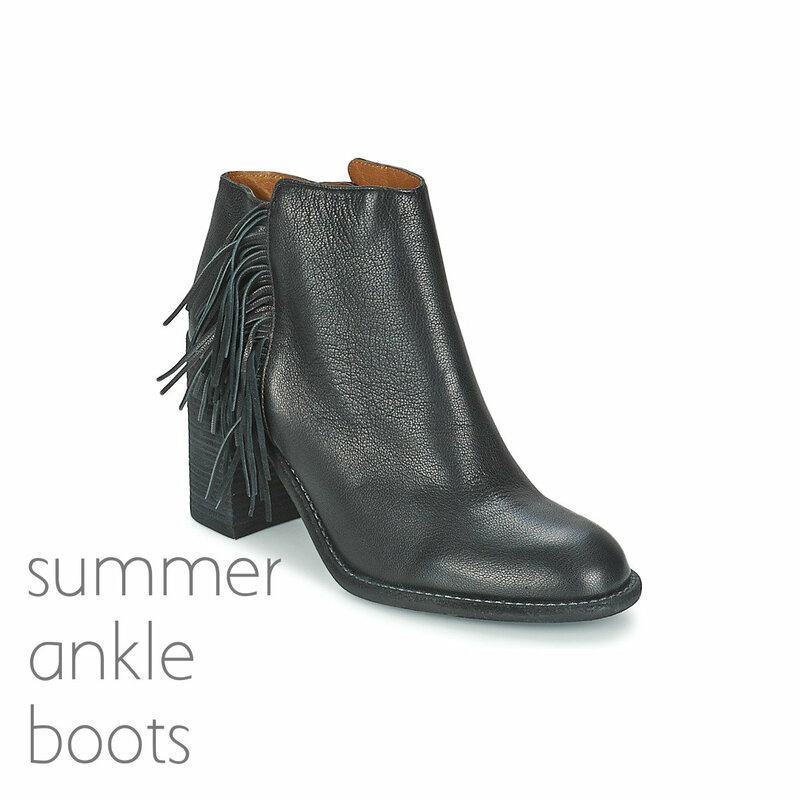 I really like the flattering cut of this pair, which are from Chloe and therefore cost a packet, but there are so many other fringed boots available online or on the high street that if you want to tap into this trend cheaply, you can. It's a win-win because these boots will also look the part for AW15 with a pair of tights and a dress; channeling the 'grown up' 1970s vibe with prints and patterns which makes the trend a double dipper and one to bookmark. Slight nod to the seasons upcoming trends done, I'm off to watch the rest of Wimbledon and definitely not think about Autumn until October at least!